Toyota utes have sat firmly at the apex of beloved Australian vehicles for decades now, but this wasn’t always the case. In their formative years, Japanese cars – or “rice burners” – were looked down upon by Aussie ute lovers as being far inferior to local made V8’s and V6’s. To most, nothing could beat the brutish power of a Ford F-series or a Holden HK – especially not the funny interiors and rattly four cylinder engines that were synonymous with early Japanese utes, mainly the Toyota Crown and Stout models. But all this changed when the HiLux came along. From “rice burner” to Australian classic, we take a look at the history of the Toyota HiLux and its rise to the apex of beloved Aussie vehicles. The history of the Toyota HiLux spans almost eight generations, during which time it has become renowned as a beloved workhorse, a no nonsense ute that bridges the gap between a work vehicle and an everyday driver. The HiLux has roots that extend beyond the Toyota Motor Corp, tracing back to the Japanese commercial vehicle manufacturer Hino Motors in the early 1960s. In 1961, Hino began producing a small ute named the Briska – one of the first Japanese work vehicles celebrated outside of Japan. The Briska’s first generation was widely lauded as a tough and versatile vehicle with many capabilities matching those of popular ‘Western’ trucks. In 1966, the Hino Briska was renamed the Toyota Briska after a partnership was struck up between the two motor companies, but it wasn’t until 1968 that the Briska was discontinued and the very first Toyota HiLux rolled off the production line at Hino Motor’s Hamura plant in Japan. This new model was a huge step forward for Toyota and Hino with both companies striving to produce medium-to heavy-duty commercial vehicles with the comfort of a passenger car. The US was the first export market to see the new vehicle, but there it was known as the Toyota Truck. Everywhere else it was known and HiLux – a marriage of the words ‘high’ and ‘luxury’. The first generation of the HiLux bore the N10 chassis code and utilised a separate frame construction with a double wishbone/coil spring suspension set up at the front and rigid axle/leaf spring arrangement at the rear. It borrowed its 1.5L engine (with four-speed column-shift manual) from the Toyota Toyoace and had a 1000kg payload and a cargo bed measured that 1850mm. In other words, the very first HiLux was no lame duck. In 1972, the second generation HiLux N20 was introduced. Aimed mainly at the US market, the new HiLux saw a number of improvements on the original, chiefly to meet the US demands for a vehicle that was a little more ‘highway ready’. This newer version was stocked with a 2.0L four-cylinder petrol engine and came fitted with a three-speed automatic transmission, a tandem master cylinder with a master vac and load-sensing brake proportioning valves that were introduced in order to keep in line with US safety standards. However, the 2.0L version was soon dropped for a 1.6L alternative in order to meet tightening US emissions laws. The next incarnation of the HiLux was birthed in 1978, ten years afters the vehicle’s introduction to the world. The third generation was very similar to the second until 1979 when Toyota saw the release of its first 4WD model (as well as diesel and double cab options). 1979 also saw the introduction of the classic ‘Toyota’ embossment on the car’s tailgate – then an optional feature but now a standard component of the car’s beloved aesthetic. In 1983, the HiLux was reinvented once again, this time taking car’s ‘jack of all trades’ ethos up a notch. The fourth generation HiLux N40 was immediately admired for its bold new looks. Both single and double cab versions were introduced, including a new raised-bed model with three bottom-hinged sides. This brought the grand total of HiLux’s range to 20 models. It was around this time that the demand for recreational vehicles began to really take off. Rival SUV models like the Ford Bronco and Nissan Pathfinder were being gobbled up by prospective markets. Toyota, always with their finger on the pulse, were quick to react, removing the bulkhead cover from the back of the HiLux cab and adding a one-piece fibreglass-reinforced plastic ute canopy. They also added a bench seat in the back and softened the rear suspension. Larger engines were fitted too, including 2.4-litre turbo and 3.0-litre V6 petrol options. The HiLux was progressing quickly and it was showing no signs of slowing down. Two decades down the track the car had become one of Toyota’s flagship models, renowned for its power, comfort and indestructibility. It wasn’t until the HiLux’s fifth generation though that the ute really began to cement itself as a true Australian classic. 1988 – the year of the Australian bicentenary – saw the launch of the brand new HiLux N50. This updated version saw many improvements on previous models; the interior became much more passenger car-like with a new dash and technological updates, and the exterior bodywork now featured integrated window sashes in the doors and a one-piece loading bay. 4WD models also now featured pumped mud guards with additional flares. 2WD models featured either 1.8-litre Y-series petrol or 2.4-litre L-series diesel engines and 4WD options featured a gutsier 2.0-litre Y-series or 2.8-litre diesel. It wasn’t until nine years later that the next incarnation of the HiLux was introduced. This intermission allowed time for Toyota to breathe and focus on splitting the Toyota range into two clear categories – business and personal. In Australia, four different options were made avaliable: 2.0 litre petrol, 2.7 litre petrol, 3.0-litre diesel and 3.0-litre Turbo-diesel. Two or four-wheel drive transmission and either single or double-cab body configurations were avaliable. Toyota’s ‘personal’ HiLux models were more feature-heavy, with technological updates to suit recreational use, whereas the ‘business’ models were simpler, more rugged. All vehicles now came with independent front suspension – a first for the HiLux – which saw the ride and handling capabilities reach new heights. The seventh generation HiLux was introduced in 2005. With a 4.0L V6 petrol donk producing 175kW and 376Nm of torque, it was the most powerful ute on the Aussie market (and a far cry from the Hino Motors Briska back in the 60s). Toyota also beefed up the exteriors of the HiLux in a big way, with the wheelbase increased from 235mm to 3085mm, the front track increased from 115mm to 1510mm and the rear track increased from 100mm to 1510mm. Safety was improved too with chassis and body stiffness improved by around 50%, as was the suspension, now running a new coil-spring double wishbone independent front suspension with ball-joint mounted stabiliser bar. All you need to do is take one look at the 2005 HiLux and you’ll see that Toyota were right on the money – it’s a beast. Australia was key in the development stages of the 2005 HiLux, something that carried on into its eighth generation. Engineers spent years testing and conditioning the 2015 HiLux, and the result was another complete makeover inside and out. The current HiLux features a stronger ladder chassis, reinforced deck structure, enhanced all-wheel drive capabilities and improved towing capacity. Inside, the ute is more comfortable than ever, with updated interiors and techy features, keeping in-line with the HiLux’s passenger car ethos. Under the hood you’ll find a high-torque turbo-diesel engine, plus it features six-speed transmission, and beefed-up suspension and brakes making it one of the most capable and versatile vehicles on the road. The HiLux has been the best-selling 4WD in Australia for the last decade with more than 860,000 utes sold, averaging at about 20,000 every year. Who would have thought that a rickety little “rice burner” could reach such heights. Check out our range of Toyota HiLux canopies here. We work with our trusted European manufacturer to bring the most stylish and functional canopies to the Australian market. If you have any enquiries about our purchasing process or installation or Toyota Hilux accesories, feel free to contact us for info or a quote. There are almost endless possibilities when it comes to modifying a vehicle. From the smallest adjustments under the hood to extravagant external mods, even the plainest stock ute can take on a whole new dimension with a little work done to it. And while we specialise in ute canopies here at the The Ute Canopy Co, there’s something about retro utes that have been taken to crazy new heights that really get us going. So here are 5 insane custom retro utes that will really make you drool. Enjoy. There’s something about custom and modified retro utes that’s damn irresistible. Here are 5 insane examples of Aussie classics that have been taken into a whole new dimension. Sometimes simplicity is the key when it comes to modifying a ute, especially something as clean and boxy as the Holden EH. This beautiful example is owned by Ben Sacilottos and was handed down to him by his father. Turning it from the decades-old Sunday cruiser into the beast it is today was a 5-year project undertaken by the renowned retrotech EH builders, the Desisto Brothers, alongside the Sacilottos family. Speaking with Street Machine about the project, Ben Sacilottos remembers the process well. “We took it off the road to raise the ride height, fit new wheels, fix the gaps and do a few minor rust repairs,” he said. “That turned into a full ground-up rebuild and became a five-year project.” The finished project is far-cry from lumbering ute that was handed down from father to son. It features a supercharged 3.8 litre engine, oyster leather (including in the tray) a custom paint job and custom interiors including a polished Billet Specialties steering column and wheel and a custom grille. Another customised classic, this Holden FX is an absolute beaut. The FX was the first ever Holden and is widely regarded as the great Australian vehicle. Despite its long history, you won’t find many as pretty as this driving around these days. This FX is another refined and elegant retro mod, owned by Mark Riek. It retains the car’s authenticity while bringing it into the modern world with some tasteful modifications both inside and out. Mark found his FX for a thousand dollars on eBay, rusted and a wreck, and spent endless hours alongside his father John working on bringing the exteriors back to life. For every hour spent on the exteriors though, Mark put at least twice as much into working on what is underneath. The engine is an original Holden grey six, supplied by Geoff Scott, featuring a Garrett T25 turbocharger, PWR water-to-air intercooler and an electronic fuel injection system with a MoTeC M84 ECU. The FX also features VL Commodore rack-and-pinion steering, a HG Holden collapsible column and column-shift mechanism and VS Commodore disc brakes. To top it off, Mark managed to source 16-inch Smoothie steel wheels for that crucial retro look. Does this one look familiar? We’re not surprised. What you’re looking at is the customised HJ ute that can be seen in the opening seen of Mad Max sitting outside Fat Nancy’s Cafe. Owned by John Zeigler, the inky black beast features a Holden Caprice nose with S Class Mercedes Benz headlights and a custom grille, and a GMH spoiler that was a prototype that never made it to production. Under the hood there is a stock 350 Chev engine with a Sig Erson cam, Pacemaker headers and a Turbo 400 transmission. The icing on the cake though is the door handles, or lack thereof. Instead of standard handles, this sleek demon features Ford boot-release buttons hidden underneath the outside mirrors. Very cool. Darren Ryan always dreamed of owning an old Holden FJ ute, but it wasn’t until a cancer scare that made him reflect upon his life that he actually took the plunge and bought one. Ryan’s father had raced FJ’s back in the 60’s so he’d always wanted one, and when what was thought to be lung cancer turned out to be sarcoidosis he began his quest to make his dreams a reality. After buying and towing home a completely destroyed 50s FJ, Ryan set out on a long and exciting (albeit expensive) journey bringing it back to life. Under the hood lies a 5.0 litre VQ Statesman engine, T700 tranmission and electronics. The old hunk was then fitted with a new driveline, VR BorgWarner differentials with 3.45s, Truetrac LSD and 31-spline axles, VR Commodore slotted discs and Showwheels KWC Forged split-spoke rims. Inside and out it is surprisingly clean and simple, maintaining its retro looks with a few modern necessities. The ute won first place in this year’s 2015 Queensland Hot Rod Show – it’s not hard to see why. We had to include a Ford in here, and this one is a incredible example of a modified 71′ XY Falcon. Leo Martino bought his ute off a mate who’d had it sitting in a carport for years. It was badly rusted and required a lot of body work including new door skins and lower front guards, new custom rear chassis rails, lower rear quarters and a new beaver panel along with a fuel tank filler and door, all done by panel beater Mars Trupkovic who also gave the ute its killer green paint job. While the exteriors are undoubtably cool, what lies under the hood is something else all together. A Competition Engines 700hp, 440-cube engine is what you can see sticking out of the bonnet, complete with CHI 3V Cleveland heads, a CHI 3V inlet manifold, a Dominator carburetor, MSD ignition, custom radiator, Magnafuel pump, ASR sump, a custom dual 3in exhaust, fused to 2in primaries and 3.5in collectors. Phew. If you’re after a quality hardtop ute canopy then give the Ute Canopy Co a call for a quote. We work with our trusted European manufacturer to bring the most stylish and functional canopies to the Australian market. What do you imagine the world’s biggest celebration of the ute is like? All you need to do is head to Deniliquin to find out. The Deni Ute Muster is a yearly congregation of Australia’s most enthusiastic ute owners, with people travelling from the far corners of the country to Deniliquin in southern NSW to celebrate the ute in all its glory. A ute muster is a traditional Australian festival, much like a rural version of Canberra’s famous Summernats Festival only with a keen focus on the ute as a part of Australia’s national identity. With a strong community ethos and family-friendly mentality, ute musters are often held alongside country fairs and other local celebrations in towns across the country. In Deniliuqin however, the ute muster is taken to a whole new level. The origins of the Deni Ute Muster can be traced back to March 1999 when a small group of community-minded Deniliquin’s got together with one goal: to put together a rural festival aimed at bringing in tourists on the quiet NSW October long weekend. Initially, the festival organisers hoped for around 500 utes to participate in the festivities – a humble goal for a then-humble festival. The festival’s first edition included horse-drawn wool wagon re-enactment, a family camp-out under the stars with a camp oven dinner, bush poetry and star gazing. It also set out to take crown for the largest parade of legally registered utes in the world. Each year the Deni Ute Muster draws sone huge names in Aussie music, with a focus on rock and country. 2015 saw Cold Chisel emerge from a short hiatus to play their only show of the year. 2016 will see the likes of Keith Urban and Shannon Noll taking the stage alongside a lineup of emerging local acts and some of Australia’s finest country artists. At The Ute Canopy Co, we strive to provide the Australian market with the most stylish and practical range of hardtop ute canopies out there with a range of features to suit the needs of any discerning ute owner. Aluminium ute canopies can be stylish, durable and practical. We strive to provide hardtop ute canopies that are even more desirable for any discerning ute owner. Nothing will compliment your vehicle quite like one of our quality ute canopies. Ours are the best on the market, boasting range of sleek European designs that are built to suit the needs of a wide variety of customers, from tradies to weekend adventurers to families. Our canopies are meticulously made and fitted with care (in Sydney and Melbourne), resulting in an extremely durable product that will last a lifetime, even under the harshest conditions at work or play. We work closely with our trusted European manufacturers to create the most stylish and functional ute lids available on the Australian market. Our canopies are made from fibreglass and steel and boast a selection of aerodynamic designs, optional tinted glass windows, LED brake and interior lights where required, and a 12 month warranty. The are far more stylish and durable than any aluminium ute canopies out there on the market. They are supplied in OEM colours and are styled specifically to compliment to each different ute model. There are no one-size-fits-all lids here! If you have any enquiries about our purchasing process or installation, feel free to contact us for info or a quote or just to have a chat! At The Ute Canopy Co, we provide the Australian market with a range of high quality fibreglass canopy options for the most popular utes on the road. Our canopies are stylish and highly functional, boasting a range of designs (and ute accessories) to suit the tastes and requirements of any discerning ute owner. On the hunt for a stylish and highly practical fibreglass canopy for your ute? Look no further than The Ute Canopy Co. Whether it’s to beef up the looks of your ute, or if you’re on the hunt for practical cover for your tray, nothing will compliment your vehicle like a quality fibreglass canopy. The range avaliable from The Ute Canopy Co are the best on the market. Tough, stylish and meticulously fitted, they are perfect for weekday tradies, weekend adventurers or day-to-day families alike. Our fibreglass canopy range boast a selection of aerodynamic designs, optional tinted glass windows, LED brake and interior lights where required, and a 12 month warranty for all models. They are supplied in OEM colours and are styled specifically to compliment to each different ute model – including curved rear door and optional spoilers. There are no one-size-fits-all ute lids here. Make your ute stick out of the crowd with a fibreglass canopy from The Ute Canopy Co. If you have any enquiries about our purchasing process or installation, feel free to contact us for info or a quote or just to have a chat! Here at The Ute Canopy Co, we provide the Australian market with high quality hardtop ute covers unlike anything else out there – canopies that are stylish and functional with a range of designs and accessories to suit the tastes and requirements of any ute owner. At The Ute Canopy Co, we strive to provide the Australian market with high quality ute covers that are stylish, durable and functional. Nothing will enhance your vehicle like a ute cover from The Ute Canopy Co.
Our extensive range is the best on the market boasting a range of sleek, aerodynamic designs that are built to suit the needs of a wide variety of customers. Our hardtop covers are meticulously built and fitted with painstaking care, ensuring an extremely durable product ready for the harsh Australian weather conditions, the vigours of work life, city living and weekend adventures. Our ute lids boast a selection of sleek designs, optional tinted glass windows (where fitted), LED brake and interior lights where required, and a 12 month warranty. They are supplied in OEM colours and are styled specifically to compliment to each different ute model – including curved rear doors and optional spoilers. There are no one-size-fits-all covers here. We work with our trusted European manufacturer to supply our valued Australian customers with quality ute covers unlike anything else on the market. We also work closely with our customers to help turn their vision for the perfect ute canopy into reality. If you have any ideas, feel free to get in touch! For any queries about our range, ute accessories, purchasing process and installation, please feel free to get in touch for a quote or for a chat! At The Ute Canopy Co, we strive to provide the Australian market with quality ute lids unlike anything else out there – hardtop canopies that are as stylish as they are functional, with a range of features and accessories to suit any needs. Here at The Ute Canopy Co, we strive to provide the Australian market with high quality ute lids that are equally functional, durable and stylish. Nothing will compliment your vehicle quite like a quality ute cover. The range avaliable from The Ute Canopy Co are the best on the market, boasting range of sleek, stylish designs that are built to suit the needs of a wide variety of customers. Our lids are meticulously built and fitted with care, ensuring an extremely durable product ready for the harsh Australian weather conditions, the vigours of work life, city living and weekend adventures. Our awesome ute lids boast a selection of aerodynamic designs, optional tinted glass windows, LED brake and interior lights where required, and a 12 month warranty. They are supplied in OEM colours and are styled specifically to compliment to each different ute model – including curved rear door and optional spoilers. There are no one-size-fits-all lids here. If you have an eye for design and a vision for how your ute could look, we are always on the hunt for new and exciting designs for ute lids. Feel free to get in touch and share your ideas with us, we can help make your vision a reality! Not matter what your looking for, we provide an expansive range of options including ute lids, full box canopies, standard canopies and ute canopy accessories. At the Ute Canopy Co, we believe that looks and functionality should be held in equal regard – especially when it comes to utes. That’s why we provide a huge range of ute canopies to the Australian market that are like nothing else: stylish and practical with a range of options and accessories to suit any needs. At the Ute Canopy Co, we hold aesthetics and functionality in equal regard. That’s why we strive to provide Australia with ute canopies unlike anything else on the market – both highly practical and great looking. The Ranger is Ford’s biggest-selling model line making up a whopping 40% of all sales for Ford in Australia. The latest revisions to this classic ute have been comprehensive, right from what’s under the hood through to a host of new accessories inside. Matched with the right Ford Ranger canopy this is a very cool looking truck. We offer a selection of different ute canopy styles for models from 2007 onwards which boast an array of aerodynamic designs, optional tinted glass windows, LED brake and interior lights where required, and a 12 month warranty. across Australia. This brawny commercial truck looks fantastic with a Toyota HiLux canopy that will make it stand out from the crowd. Our canopies and accessories are built to fit models from 2005 onwards, and boast an array of aerodynamic designs, optional tinted glass windows, LED brake and interior lights where required, and a 12 month warranty. Nissan have a long history of producing tough, dependable utes which are extremely popular in Australia. With each new Navara model the boundaries of innovation are being pushed. Matched with a Nissan Navara canopy this ute takes on a whole new dimension. Our hardtop ute canopy options are built to fit models from 2005 onwards. They boast an array of aerodynamic designs, optional tinted glass windows, LED brake and interior lights where required, and a 12 month warranty. The curved cabin shape of the Mitsubishi Triton gives it one of the roomiest interiors in its class with a more spacious and comfortable cabin than anything else on the market. The unique curves also make it ideal to be accessorised with a Mitsubishi Triton canopy that will greatly compliment the car’s contours. Our ute canopy options are built to fit models from 2007 onwards, and boast an array of aerodynamic designs, optional tinted glass windows, a styled curved rear door, LED brake and interior lights where required, and a 12 month warranty. The D-Max is tough, practical and pretty damn cool. Its looks are rugged rather than flashy, but that’s what the D-Max is all about. Dressed up with a Isuzu D-Max canopy this ute looks great, enhancing aesthetics without forsaking the vehicle’s steely demeanour. Our canopies are built to fit models from 2012 onwards and boast an array of aerodynamic designs, optional tinted glass windows, a styled curved rear door, LED brake and interior lights where required, and a 12 month warranty. The Actyon Sports ute is gaining huge popularity in the Australian market. The newest releases have seen significant improvements in exterior and interior styling and features. A SsangYong Acyton Sports canopy will make this impressive ute stand out from the crowd. Our hardtop sports canopies are built to fit models from 2007 onwards and boast an array of aerodynamic designs, optional tinted glass windows, a styled curved rear door, LED brake and interior lights where required, and a 12 month warranty. The Volkswagen Amarok is a brawny ute with passenger car manners. Comfortable and sophisticated, with handling and steering that is not far short of a good passenger car, it’s suitable for everyday living as much as it is for work, and it looks great when dressed up with a Volkswagen Amarok canopy. Our ute canopies and accessories are built to fit Amarok models from 2010 onwards and boast an array of aerodynamic designs, optional tinted glass windows, a styled curved rear door, LED brake and interior lights where required, and a 12 month warranty. We work with our trusted European manufacturer to bring the most stylish and functional ute canopies to the Australian market. If you have any enquiries about our ute canopy range, purchasing process or installation, feel free to contact us for info or a quote. The ute is synonymous with Australian auto culture and has been for decades, and although Australia is often credited with ‘inventing’ the ute, the pages of history aren’t quite so clear. Despite the way legend tells it, the origins of the ute are still a little unclear. So, who owns the title of the first ute ever built? In response, an opportunistic young designer at the Ford plant in Geelong named Lew Bandt took the idea and ran with it, modifying a 1933 coupe by building a tray on the back and reinforcing the chassis so that could take a heavier load. His design – the “coupe utility” – was approved and the ute went into production the very next year. The “coupe utility” had a wheel base of 112 inches and a five foot five inch tray that could carry 550kg. When this Australian beast was presented in the US by Henry Ford, he nicknamed it the “Kangaroo Chaser”. But do the origins of the ute go back even further? Perhaps the earliest incarnation of a ute-like vehicle is a 1903 Oldsmobile, built 30 years prior to the Bandt’s “Kangaroo Chaser”. The Oldsmobile, one of the first vehicles to ever go into mass-production, definitely had a distinctive ute look, with a small tub-like tray that sits behind the dual cab. However, the cab is uncovered, and it would be very difficult to any pigs in such a tiny tray. To classify the Oldsmobile as a ute might be a bit of a stretch. 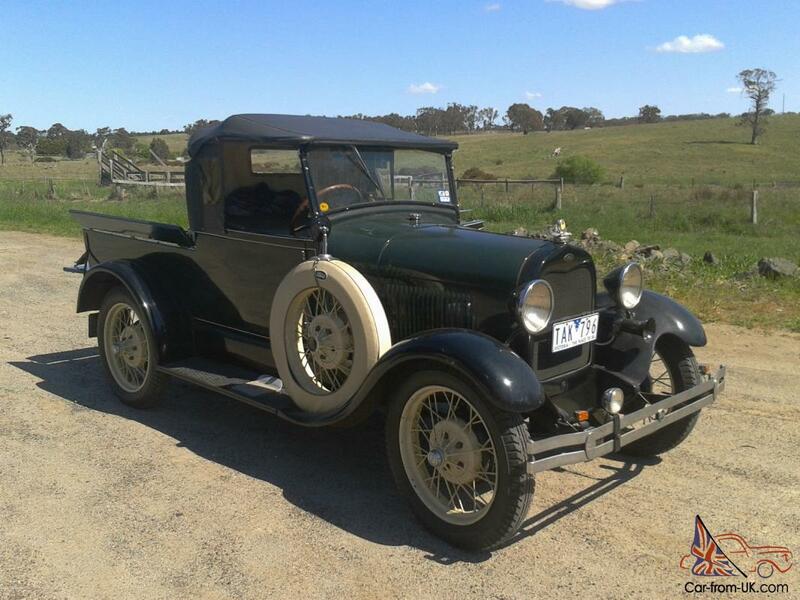 However, if we are to define the ute as per the original criteria requested by the Australian farmer’s wife, then perhaps neither the 1924 Dodge or the 1925 Ford Model T properly fit this description. This brings us a 1928 with the Ford Model A which was produced in a ‘pickup’ style with a tray, a closed cab with a windscreen to keep rain and wind out, and rigid doors with glass windows. This was one of Ford’s most popular early models. On the other side of the world, Volvo has also begun producing pickup style vehicles with open and closed bodies, similar to the Ford Model A – yet another contender for the first ute ever built. Perhaps the crown for the original ute will never be unanimously agreed upon, but what is clear is that the need for versatile vehicles has been around since cars have been produced. In 1951, Holden produced their hugely popular own coupe utility, thus sparking the time-honoured rivalry between Ford and Holden, further solidifying the place of the ute in Australia’s cultural identity. The Gippsland farmer’s wife would never know what she had started. The Holden Special Vehicles GTS Maloo ute is one of the most collectable vehicles in the modern muscle car era. Fitted with the same hi-tech computer-controlled stability control system as a Porsche 911, and the same supercharged V8 engine that’s in the Chevrolet Camaro, it is widely considered the fastest ute in the world, capable of hitting 0-100 km/h in just 4.5 seconds – exactly the same as the Porsche Carrera 911. Meet the Holden Special Vehicles GTS Maloo – the world’s fastest ute, packed with the torque and handling capabilities as the Porsche Carrera 911 and the same supercharged V8 engine as a Chevrolet Camaro. Not your average Holden ute, the GTS Maloo managed to stay under wraps while they developed the car over a four year period. Coming in at around $85,000 it is the the mot expensive ute ever sold in Australia. With only 250 models ever made, it is also unbelievably exclusive (the first 150 sold within 24 hours) – perhaps the rarest in Australian history. This compares to the lauded Falcon GT final editions, with only 500 made, and the HSV GTS sedans which sell in the thousands each year. Although there are two US-made utes (or pickups, as they’re called in the States) that could match the Maloo in power, both ride too high and are too heavy to match it in speed. The Maloo GTS also has incredible breaking power, with a powerful set of AP radical six-piston brake callipers with 390mm front and 371mm rear two-piece rotors, similar to what you would find in a V8 Supercar. The GTS Maloo features torque vectoring technology that would find in a Porsche Carrera – widely considered to be a world-first in a utility vehicle. Back in 2004, a Dodge Ram packed with a V10 taken from a Dodge Viper cracked the top speed ever recorded from a ute at 248.7km/h. Then, in 2006, Mark Skaife claimed the Guinness World Record in a HSV Maloo R8 at 271.4 km/h. If you have any enquiries about the purchasing process or installation of our ute canopies, feel free to contact us for info or a quote.